THIS LEASE AGREEMENT ("Lease") made as of _____________, 20__ by and between COMMERCIAL PROPERTY LANDLORD ("Landlord"), with mailing address at __________________ and ACCEPTABLE TENANT ("Tenant"), with mailing address at _____________________. Section 1.1. Certain Defined Terms. A. 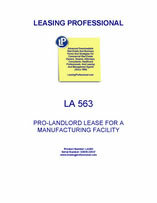 "Landlord's Building" means the industrial building of the Landlord located at _______________. B. "Tenant's Premises" means all that _________ square foot portion of the industrial building outlined on "Exhibit "A" attached hereto. C. "Permitted Use" means operation of a manufacturing facility. The following document is attached hereto, and such documents shall be deemed to be a part hereof. "Exhibit "A" - Tenant's Premises. Section 2.1. Length of Term. Landlord hereby leases to Tenant, and Tenant hereby takes from Landlord, the Premises for the Term and at the Rent hereinafter described. The Term of this Lease shall be for _____________ months following the commencement date. The Rent shall be $____________ payable monthly in the amount of $________ per month on or before the first day of each month, at the office of the Landlord or such other address as shall be designated in writing by Landlord from time to time, without any prior demand therefor and without any deduction or offset whatsoever, except as may specifically be permitted herein. Tenant shall pay all Rent when due and payable, without any offset, deduction or prior demand thereof whatsoever. Any payment by Tenant or acceptance by Landlord of a lesser amount than shall be due from Tenant to Landlord shall be treated as payment on account. The acceptance by Landlord of a check for a lesser amount with an endorsement or statement thereon, or upon any letter accompanying such check, that such lesser amount is payment in full, shall be given no effect, and Landlord may accept such check without prejudice or any other rights or remedies which Landlord may have against Tenant. Tenant shall pay as Additional Rent any money required to be paid as such pursuant to the provisions of this lease, as well as all other sums of money or charges required to be paid by Tenant under this Lease, whether or not the same shall be designated "Additional Rent." If such amounts or charges are not paid at the time provided in this Lease, they shall nevertheless, if not paid when due, be collectible as Additional Rent with the next installment of Rent thereafter falling due hereunder, but nothing herein contained shall be deemed to suspend or delay the payment of any amount of money or charge at the time the same becomes due and payable hereunder, or limit any remedy of Landlord. Tenant agrees to provide the written personal guaranty of ____________, , its __________ in the amount of $ _______ Dollars, upon execution of this Lease Agreement, said guaranty to be in full force and effect during the term of the Lease. Said guaranty shall be returned by Landlord upon the termination of the Lease, after payment of all sums due Landlord. Tenant hereby deposits with Landlord the sum of $__________ to be held as security for the full and faithful performance by Tenant of Tenant's obligations under this Lease and for the payment of damages to the demised Premises. The security deposit shall be returned by Landlord to Tenant at the termination of the Lease, after payment of all sums due Landlord. No work which Landlord permits Tenant to do pursuant to this Lease, whether in the nature of erection, construction, alteration or repair, shall be deemed to be for the immediate use and benefit of the Landlord so that no mechanic's or other lien shall be allowed against the estate of Landlord by reason of any consent given by Landlord to Tenant to improve the Premises Tenant shall pay promptly all persons furnishing labor or materials with respect to any work performed by Tenant or its contractor on or about the Premises. In the event any mechanic's or other lien shall at any time be filed against the Premises by reason of work, labor, services or materials performed furnished, or alleged to be performed or furnished, to Tenant or to anyone holding the Premises through or under Tenant, Tenant shall forthwith cause the same to be discharged of record or bonded to the satisfaction of Landlord. If Tenant shall fail to cause such lien forthwith to be so discharged or bonded after being notified of the filing thereof, then, in addition to any other right or remedy of Landlord, Landlord may discharge the same by paying the amount claimed to be due, and the amount so paid by Landlord including reasonable attorney's fees incurred by Landlord in procuring the discharge of such lien, together with interest thereon at the Default Rate, shall be due and payable by Tenant to Landlord as Additional Rent. Section 5.2. Tenant's Trade Fixtures. All trade fixtures and apparatus (as distinguished from leasehold improvements) owned by Tenant and installed in the Premises shall remain the property of Tenant, and shall be removable at any time, including upon the expiration of the Term; provided Tenant shall not at such time be in default of any terms or covenants of this Lease; and provided further that Tenant shall repair any damage to the Premises caused by the removal of said fixtures. If Tenant is ill default, Landlord shall have the benefit of any applicable lien on Tenant's property located in or on the Premises as may be permitted under the laws of _______________, and in the event such lien is asserted by Landlord in any manner or by operation of law, Tenant shall not remove or permit the removal of said property until the lien has been removed and all defaults have been cured.